In a saucepan, combine the cream and milk. Bring it to a near boil. Turn off the heat and immediately add the vanilla chips. Using a spatula, keep stirring until the morsels are melted (see tips). In a mixing bowl, whisk the egg yolks with 2 tablespoons of sugar until they become pale yellow. Add the vanilla extract, salt and matcha green tea powder. Combine the dairy liquid with the egg mixture by slowly adding a ladle of the dairy liquid at a time to prevent the yolks from curdling (it's called tempering). Strain through a fine mesh to make sure there are no chunks of vanilla chips or milk skin left. 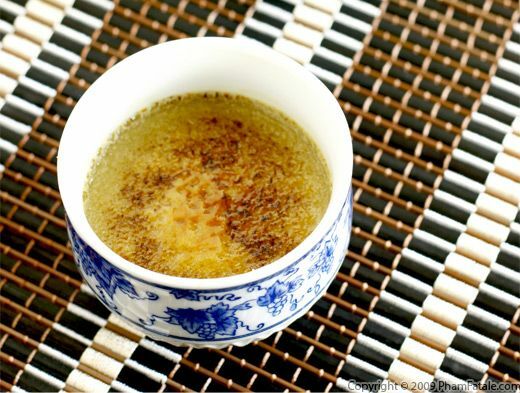 Fill up 8 Japanese tea cups (make sure they are heat-proof) with the custard. Place them in a warm water bath in a deep baking pan. The water should go half way up the side of the ramekins (at least a 2-inch-high level of water). Loosely cover the dish with a sheet of aluminum foil and place in the oven for 35-40 minutes. The texture of the crèmes brulées should be a little jiggly but not liquid. Allow the crèmes brulées to cool completely first, then plastic-wrap each individual cup and chill in the refrigerator for at least 3 hours. The fat from the cream may pick up some other odors from the refrigerator if the cups are not sealed properly. 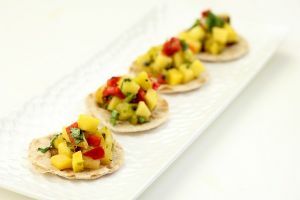 When serving, unwrap the cups and sprinkle about 1-1/2 teaspoons of sugar in each cup, then caramelize with a culinary torch. Matcha is Japanese green tea powder. I buy mine at Teavana in the Stanford Shopping Center, in Palo Alto, California. You can also find it online. It's fairly expensive and has a very delicate flavor. As soon as your matcha tea box is unsealed, store it in the refrigerator or in the freezer because of its short shelf life. To check for quality, matcha should have a beautiful jade green color. If it's yellow and dull, it's time to toss it. You can use it often in baking for macarons, cakes, cookies or custards or you can turn many pastries into a nice green color. Be creative on St. Patrick's day and Halloween! I used Guittard vanilla chips (apeels). I buy them directly from my local market at the Milk Pail Market, 2585 California Street, Mountain View, CA 94040, but you can order through eBay if you can't find them. 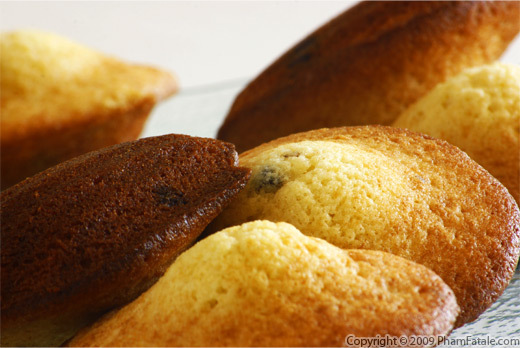 Or you can always substitute with white chocolate chips but you might want to lower the amount of sugar in the recipe. While waiting for the cream and milk to boil, you have to be very careful. Don't go anywhere else. If the phone rings or someone's at the door, let it go. You really have to focus until the cream and milk is hot, otherwise you'll be cleaning your stove and scraping off burnt milk all night long! As soon as some bubbles come up, turn off the heat and immediately add the vanilla chips. While letting the vanilla chips steep in the dairy mixture, it's preferable to stir the mixture until the liquid is smooth, instead of whisking to create as little milk froth as possible. You don't want a latte foam to form. When you take the crèmes brulées out of the oven, they should come out a little jiggly. Refrigerating them for at least 3 hours helps create a firmer, creamy consistency. If you don't own a blow torch, you can place the crèmes brulées under the broiler of the oven until the sugar caramelizes. But if you decide to make this dessert quite often like we do, a culinary torch is a good investment. 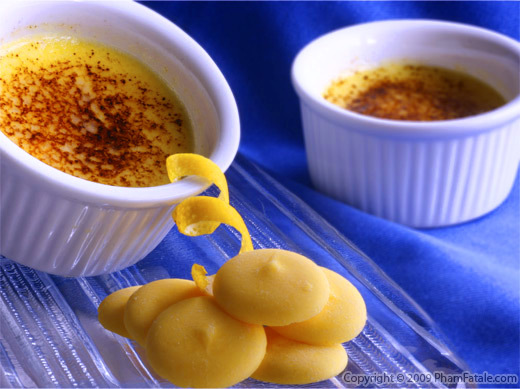 I like to serve crèmes brulées in small-sized ramekins among other miniature sweets. 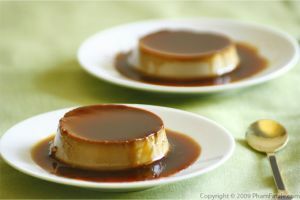 I served them in 8 Japanese tea cups; you can serve them in 4 regular ramekins for very hungry dessert eaters. 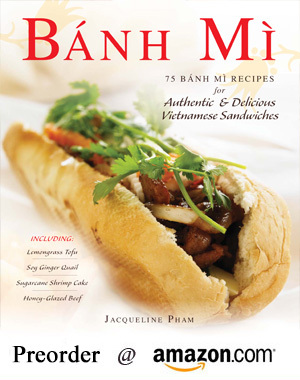 Published By: Jacqueline Pham on December 9, 2009. Great variation on a classic! 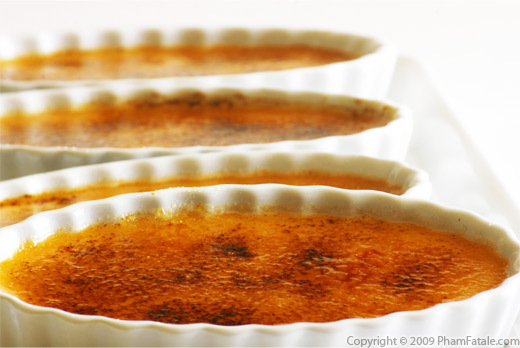 I've been craving brulee lately, one of the few desserts I really love... must be the cold weather! 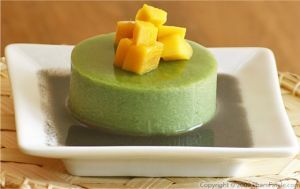 I love matcha and its versatility - which you've just proven again with this wonderful sounding desert. Thanks for sharing. 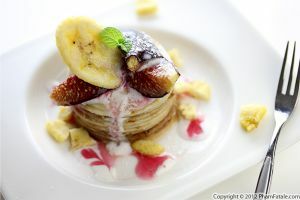 This looks delicious and I would like to try it. What are vanilla chips? I gave the recipe to a friend. She said it was fantastic. Thanks.